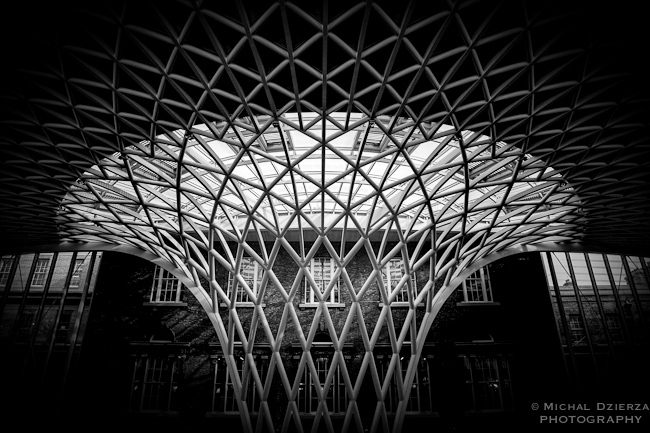 Or, to be more precise, the newly-opened concourse at King's Cross station with its gorgeous roof reminiscent of the Great Court roof at the British Museum. The new roof is a fantastic structure to photograph. It's been built in a way which draws light in through a relatively small (compared to the size of the structure) section closest to the main station building, but big enough to provide most of the concourse with enough natural light during the day. The gallery below includes a handful of images taken late in the afternoon, but I'd love to go back and see how the light changes there at different times of the day. Oh, and ten points to whoever came up with the idea of 'recreating' platform 9 3/4 with its partly-on-the-other-side luggage trolley. The crowds loved it.